A woman in Camarines Norte earned praises from netizens for her bravery when she took a video of an angry man who was spanking his own child. 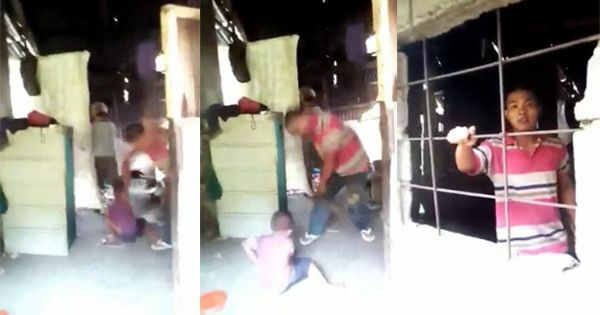 Facebook user Janer Andal Ma Alyziel posted a video that captured a dramatic yet disturbing scene where a father, identified as Aladin Callos, was hitting his son with a piece of wood inside their residence. Upon noticing her presence, Callos tried to drive Andal away and warned her not to interfere. The concerned neighbor can be heard telling the angry father that she will report the incident and show the video to the Department of Social Welfare and Development. Many believed that Callos was taking a disciplinary action after the boy committed a sin. However, some said his act was abusive and certainly not the proper way to discipline a child as it was a form of maltreatment. Andal already sought the help of someone from a local ABS-CBN station. Her video has gone viral, garnering more than 18,000 shares and over 321,000 views as of 4:30 p.m. today. Do you think it was child abuse? What should be the right way to discipline a child?